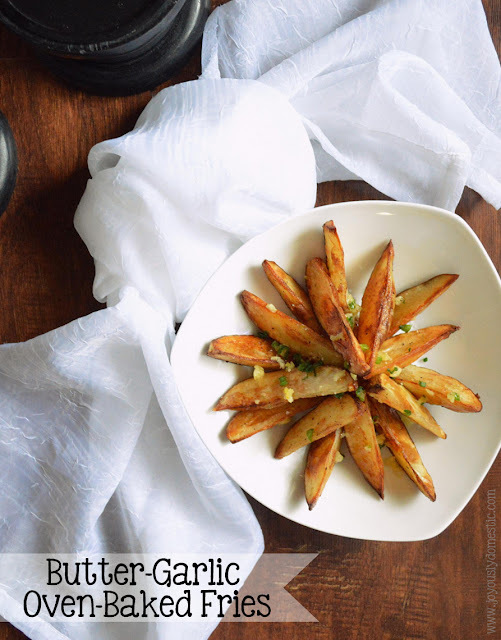 Once you try this recipe, I'm pretty confident that you'll not return to making homemade fries any other way. The technique of covering the fries with foil during the initial minutes of baking results in such a fluffy, creamy interior. Yet, the exterior is nothing short of fabulously crisp, blistered and golden thanks to the ultra high heat utilized while the fries are uncovered during the remainder of the baking process. And, perhaps the highlight of these fries is the garlic butter that the baked fries get tossed in. Glorious. It truly takes these already amazing fries simply over the top. Allow potatoes to soak in a bowl of cold water for 30 minutes. Drain and pat potatoes dry with a clean kitchen towel. Set aside. Drizzle 2 tablespoons of oil onto a large baking sheet. Sprinkle about 1 teaspoon salt and 1/2 teaspoon pepper into the oil. Spread the oil evenly around the pan. Then, add the potatoes to the baking sheet and drizzle on the other 1 tablespoon of oil. Sprinkle a bit more salt and pepper on potatoes. Spread in an even layer across pan. Cover tightly with foil and bake for 10 minutes. Then, remove foil and bake another 10 minutes. Flip potatoes over and bake another 10 - 15 minutes or until super crispy and golden. While potatoes are baking, melt butter over low heat in small saucepan. Add in minced garlic. Cook 5 minutes or until garlic is tender. 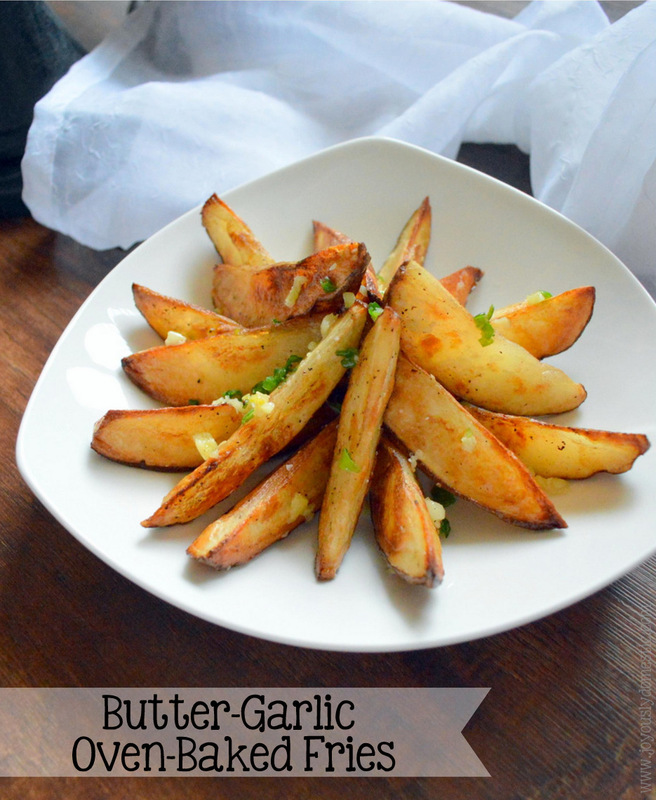 When potatoes are done in oven, toss them in a large bowl with the garlic butter. Sprinkle in scallions or chives. Season with a little more salt, if desired. It is recommended to lay fries out in a single layer on a cooling rack to drain butter and so that fries do not get soggy. Serve immediately. Adapted from "The Sandwich King." 03/01/16: Updated photos. Updated recipe for clarity.